Your scar does not look hypertrophic but the photo is quite small so the details of the scar texture are not very clear. Since your scars are right in the middle of the neck, it would be better to use a 1 mm dermastamp instead of a 1.5 mm size. Yes you should definitely try the dermastamp. If the scars are around your wrist, a 1 mm dermastamp is suitable. Dermarolling / Microneedling / Re: Do you sell needles thinner than 0.25 mm? When our store shows that the needles are in stock, they are in stock. The largest tatoo needle factory in China has been trying to create 1.75 mm needles for us for the past six months. We paid them 6000 dollars and they worked hard but they are not able to, so far. We are very disappointed but we can only wait. Their machines are not able to solder them onto the bar so short. The production speed is too slow because they have to do it by hand, and they refuse to do that. They are now experimenting with special moulds to modify the machines. So no, when our store does not show something, we do not sell it. And when our store shows something available for sale (if you can add it to your shopping cart), it is in stock. The plastic box is made of thermoplastic material, so itä's very soft. It's a principle of physics that a softer substance is not able to scratch a harder substance, so the only thing that could theoretically happen is that the needles would bend. This is however totally impossible in practice, since you would have to use tremendous pressure, pushing with extreme force to cause the needles to bend. The storage container for the Dr. Roller is intended to be able to clean the roller in. It's actually a very clever solution. Dermarolling / Microneedling / Re: Do you sell This stock Item??? Our needles have an extra long, extremely thin taper that cannot be any thinner than they already are. We will soon be sold out of our single needles, as the factory spent half a year trying to produce a new batch according to our specifications and they are still struggling. Everything we sell is visible in our online store, we do not stock needles thinner than 0.25 mm. Scar tissue has no or very limited metabolic activity (no blood supply etc). Miconeedling restores or partially restores the metabolic activity in the scar. It triggers re-vascularisation (new blood vessels) and as soon as there is a blood supply, the scar starts to behave more like "normal" skin and there is a big chance it will improve in appearance. What type of scars do you have? Scars usually need a combination of a regular dermaroller with the single needles or with a dermastamp or with a one liner roller. It depends on the type of scars. In your case, a 1 or 1.5 mm dermastamp is the best option. The five-week interval to use a one liner dermaroller is only if you use it in combination with a regular roller, if the one-liner roller is used in between the dermarolling sessions with a regular roller. It is the case in the link you provided. A dermaroller greatly enhances the penetration of any skin care products so yes, it is a good idea. The best size for penetration enhancement in that area is a 0.2 mm dermaroller. 1) Increased pigmentation of the skin (brown colored dark circles), being quite common in darker skinned individuals. Or melasma, or sunspots. Yes, stamping 10-15 times is enough. Indented scars are not easy to solve (especially if on the nose) and trying various approaches is often necessary. So, if the scar is not responding to stamping itself, combine it with copper peptides or the suction method. Unfortunately, there is no single approach that works in 100% of cases and 100% of skin conditions. Each individual has to improvise a little. You can start applying Infadolan now, to keep the scar soft and moisturized. Every day you'll apply pressure with your fingers onto the scar for approx. 20 seconds, spot by spot. A scar typically has reduced blood circulation and applying pressure will expel deoxygenated blood, allowing fresh oxygenated blood to flow in. This pressure will thus mechanically prevent the formation of a hypertrophic/raised scar. Six to eight weeks after the surgery, start gently with a 1.5 mm dermastamp. When you for example injure yourself or when you have chronically inflamed acne, the primary goal of the body is to fix it and to fix it quickly and efficiently to prevent infections etc. Gluing everything together is probably the quickest way and our body is not concerned with appearance of the scar. However, not every scar is tethered. To Boafriend: You just have to be more patient. We have customers who have been struggling with acne scars for over a year and they eventually succeeded. It is not realistic to try suctioning once and immediately expect permanent results. You should definitely use Tretinoin cream (we sell it). It works for hyperpigmentation and sun damage. Buy the 0.1% Tretinoin for your arms and back. This percentage is too strong for the face so mix some into your ordinary facial cream and use it on your face. Start using a 0.5 mm regular dermaroller, about three times a week. On the days when you do not roll, apply Tretinoin. Initially, Tretinoin dries out the skin so you have to moisturize a lot. If you get no improvement in six months, write me again. Sometimes the pigmentation is very deep (in the dermis) and that is much harder to solve. Dermarolling / Microneedling / Re: Anything that numbs better than EMLA? Most topical numbing creams contain Lidocaine. Emla contains 2.5% Lidocaine and 2.5 % Prilocaine. Xylocaine cream contains 5% Lidocaine. You have to leave it on for at least 45 minutes and if you cover it with saran wrap, it will enhance the efficacy. Do not apply a numbing cream on extensive areas in one session. The skin will never be completely numb when using an OTC numbing cream but it will reduce the pain to a more bearable level. A numbing cream that makes skin more numb contains a higher percentage of numbing substance and this percentage can only be administered by trained staff. From my own experience, the only area I am not able to roll/stamp/needle without a numbing cream is the area above the upper lip. I feel pain in spite of using a numbing cream but the pain is very much reduced. Legolas, if I remember well, you are dermarolling for red stretch marks. The UPF factor represents a protective ability of clothing against the UV radiation (UV A/B/C). So, clothing that is UPF 50 is the best you can get after needling your scars. Even a lower UPF will be enough for this purpose. You do not have to worry about it, unless you are many hours in the sun after dermarolling. "The size is reduced by 50% and the redness turns to a white" raised worms". I have asked him to post on our forum and I hope he will. Dermarolling / Microneedling / Re: Different length needles on face? If you have wrinkles right around your lips, I recommend a 1.5 mm dermastamp. A 1,5 mm dermastamp goes deep and it is easy to maneuver in this area. The area around the lips is very sensitive and you will likely need a numbing cream. A dermaroller can improve only one of them: The loss of skin elasticity. A 1 mm dermaroller reaches the dermis and it should improve the elasticity. I do not know whether there will be any significant difference in the effects of a 1 mm and a 1.5 mm dermaroller, concerning your lower face. The skin around the eyes is thin, while the skin on the cheeks is quite thick so you can give a 1.5 mm a try. You can roll with your 1 mm roller in between the sessions with the 1.5 mm roller. 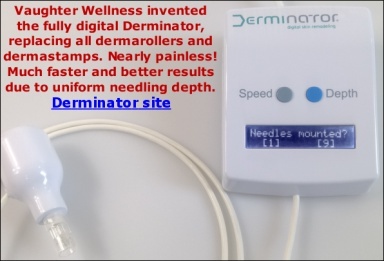 I have received several emails from our customers saying that the most effective approach that improved their sagging skin was a combination of a short-needled dermaroller (a 0.5 mm or shorter), used several times a week and a long-needled dermaroller (a 1 mm or longer) used according to our instructions.